Special Note: Please seriously consider posting this article to Facebook so the information can be widely disseminated. There are share buttons at the end of this article. Thank you. a. Two women, both named Deborah Cave (very unusual name), both of similar height, hair color and hair length, both in Colorado, both claiming to have been in California at an earlier age. b. One Deborah says that she is the real mother of James Holmes, and that he was forcefully taken from her and adopted by the Holmes. The other Deborah is on the Board of Directors of the Colorado Coalition of Adoptive Families, an older woman with much younger adoptive children (i.e., maybe a substitution for the earlier loss), who has degrees, not related at all to anything dealing with adoption, and which one of them was earned in California (possibly during the same period when she could have had birth to James)? [Updated 04 Jun 2015] – The Psychiatrist who did the only taped interview with Holmes talks about his dilated pupils in explaining why he would periodically check his pupils and heart rate HERE. You can actually see him do this HERE. Please read further down about LSD use by CIA during MK Ultra and pupil dilation. Also during Day 21 of testimony, the psychiatrist get’s James to talk about seeing FBI agent’s watching him while he was at the shooting range, you can view that discussion HERE. A hallmark of false flag operations is FBI involvement in the background, steering events. And during an exchange about the need to verbalize any past trauma he experienced, James says he would if he could remember it (a possible indication of split personality). [Updated 29 May 2015] – Read the complete famous notebook James supposedly wrote and sent to Lynn Fenton HERE Also, in watching the testimony of Corbin Dates, (See further down in this post his interview with MSNBC on the day of the shooting), neither the prosecution or the defense brought out the fact that he stated the suspect “had a goatee”. See the arrest affidavit on Holmes, page 6, for the summary of what Dates said that day. Of course, Holmes did NOT have a goatee. [Updated 05 Aug 2014] – I was reviewing all the documents I have on James Holmes (available here), and came across the Arapaho police booking form, where he was booked for the murders in the theater. Note that on the 3rd line of the form, under “Hair Color” it is listed as BROWN, not the “Joker” orange color we see in the photo here. It is listed as the NORMAL color of his hair…so WHEN did the hair color change? [Updated 04 Jun 2013] – The Judge has accepted a please of Not Guilty By Reason of Insanity, thus blocking a trial where we might actually LEARN something about what happened BEFORE the shooting at the theater. When Dr. Lynne Fenton “...told police in June 2012 that the neuroscience student was a ‘danger’ to the public due to homicidal statements…” according to court testimony reported 04 April 2013, why did the media not question the fact that on 30 Aug 2012 she stated she did NOT tell the police he was a danger? From the article in the Denver Post, “…asked whether she had ever contacted authorities for reasons required by the state law that mandates psychiatrists report specific threats of violence made by their patients, Fenton said she had not…”? A search warrant for the cellphone James Holmes had, reveals information about when he was apprehended. “…In addition to the weapons, gas masks and body armor recovered at the scene and when Holmes was arrested, Fyles said police also confiscated several plastic clips, like those used to hold down picnic tablecloths, that had been wrapped in turquoise duct tape. One of those clips was found by police on the blood-stained emergency exit door to Theater 9, holding it ajar. [Updated 22 Dec 2012] – The Huffington Post has a story about Lucid Dreaming (“Have Neuroscientists build a Dream Control Device?”) in which they show how scientists can train a mouse to run a maze; then when the mouse is sleeping (lucid dreaming), they trigger it remotely to “turn left” or “turn right”…the story goes on to say that “In short, these scientists have discovered a way to track and control dreams.” Since a “Lucid Dream” is where you are able to function physically while in a dream state, and based upon further evidence listed below, why has the MSM not fully investigated both the Jared Loughner, James Holmes, and Adam Lanza cases to see if this was done to them? In addition, there is this: A actual “Lucid Dream” mask that is being marketed as allowing you to “take control of your dreams”, in essence where you “wake up” inside of your dream and begin interacting within that dream [Make sure you watch the video]. This is exactly what both James Holmes and Jared Loughner talked about, and why it is such a key thing for the MSM to investigate. If someone could continually place these guy’s into “Lucid Dreams” (or temporal illusions) where they thought they were in a dream, interacting, and then set a “trigger” for them to go into it, how do we NOT know this happened to “trigger” them as a Manchurian Candidate? be killed in jail, same result. However, I do not see any circumstance where he will have a public trial. And question yourself: What has happened to his therapist, his family, and friends/colleagues? Why has NO ONE gotten a single interview of any substance with anyone? I know of 10 relatives who would spill their guts about me for $1000, so please don’t say no one was asked. [Update 16 Aug] – in the audio of police, at approx 10:15, you can hear the officer say he needs the movie to be shut off in theater #9. (go to bottom of story to video of police audio) This means that the normal automated emergency procedures were either disabled or non-functional (View this excellent post on what goes on inside a theater with the emergency doors and protocol, and how none of that was apparently followed at Aurora…I have archived the post because it is so important to understanding a key hole in this story). Why has the MSM been silent on this key piece of info that goes directly to how James Holmes was able to prop the emergency door without it alarming? These are the same guy? Why does the MSM report that James Holmes was acting crazy in jail, yet the local Colorado news station reports that he is completely normal? Why did victims report two shooters, yet the MSM ignores this? Why has the MSM not asked if anyone working at the theater discovered the emergency exit door open in the approximately 30 minutes between when it was supposedly blocked open and the shooting started? Also, how does someone “kick in” an emergency exit door from the outside, when the exit doors only open one way, to the outside? Who was the person that some of the victims state walked out the emergency door to take a phone call, and appeared to be signalling someone? Since the media has labelled the person who went to the exit door as James Holmes, why hasn’t the MSM requested by FOIA the phone records of Holmes which would verify it was his phone, and because of E911 technology, place the phone in the movie theater. Who was calling James? What were his movements that night before the shooting (Remember in the Casey Anthony case, before the trial there were records of her movements by her cell phone produced by the media). Even if they are unsuccessful in getting the records, why no story on the attempt to get them? Since there was enhanced police presence at the theater due to the premiere of the Batman movie, why did the police not notice James Holmes as he suited up at his car? Did they not patrol around the theater within the 30 or so minutes between the emergency door being opened and the shooting beginning? Why has no one asked if there was a policeman or policemen in the theater during the screening, and thus possibly able to shoot James Holmes? Why do some victims report the gas cannisters came from two different locations in the theater, yet no one in the MSM questions the police on this? Why do victims report that James Holmes methodically picked his victims, in contrast to the media’s reports that he seemed to randomly spray gunfire? Why did James Holmes suit up almost completely armored, yet give up peaceably and did not take his own life? press have a picture showing various parts of the armor (including gas mask), strewn around the area of the emergency exit? Why haven’t they requested clarification on this? 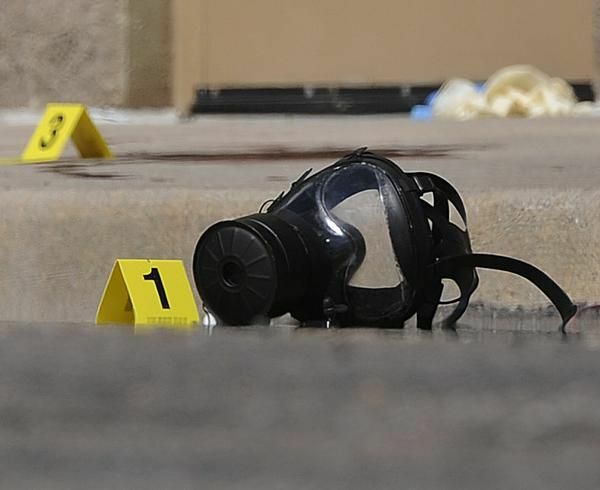 Since the Aurora Police radio transmissions state that they had the suspect in custody within 90 seconds of arriving, and he was in full combat gear, including the gas mask, how come a SECOND GAS MASK with blood stains is found down at the end of the building hundreds of feet away? Why has the MSM largely ignored the fact that James Holmes NEVER said he was “The Joker” to anyone, not least the police? If James Holmes was arrested at the back of his car, why is the passenger side window and quarter windows smashed out, which you can clearly see in this photo? Since witnesses say James Holmes “picked people up off the floor and shot them” point-blank range, there would be blood all over him. Why has the MSM not asked if the police saw him drenched in blood and other tissue when they arrested him, as he was still fully dressed in his “tactical clothing”? Why did the police report that James Holmes immediately tell them he had booby-trapped his apartment if he wanted to produce carnage? And where did he get the technical savvy to so intricately booby-trap the apartment? According to news reports, James Holmes was an “outstanding marksman“, however no one seems to be seeking out how he received this training? As one of the big stories in the first days concerning James Holmes was the “bizarre” messages he left on the answering machine at Lead Valley Range shooting club, how come the MSM has not questioned Lead Valley Range owner Glenn Rotkovich on why he accepted an application purported to be by James Holmes that had a TYPED signature, instead of a WRITTEN signature, and how would he know this was filled out by James Holmes if there was no written signature? (This form was originally D/L by me and linked from Fox News). According to this radio interview with Glenn Rotkovich, he admit’s he never met with James Holmes and admits the voice messages could’ve been a prank committed by someone other than James, why did the MSM not interview this man in-depth as to why he did not indicate this could be a bogus form since it did not have a written signature? My note: In the radio interview, Rotkovich says he first put two and two together after the shootings when one of his employee’s called him and said wasn’t the guy who filled out the app a month ago named James Holmes, and Rotkovich immediately remembered the name. Maybe it’s just me, but I don’t know how they would have remembered this since James Holmes never contacted Rotkovich after the initial application on 25 Jun 2012…who is this employee who reminded him of James Holmes and why hasn’t the MSM sought to interview that person? How come the package James Holmes allegedly sent to the Colorado University psychologist containing his plans on carrying out the attack sat in the campus post office for over a week without being delivered? Why does John Jacobson say of James Holmes “…His grades were mediocre. I’ve heard him described as brilliant. This is extremely inaccurate,…” and that Jacobson, who Holmes listed as a mentor but said he merely ran the lab in which Holmes worked, said he was accepted into the camp because he had a background in computer programming. However, the exact thing that Holmes states he was studying under Jacobson, who was his mentor, is what Jacobson is known for and has written papers on and even appears on YouTube discussing? 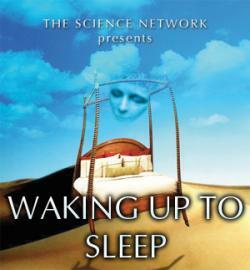 – This Terry Sejnowsky is a renowned Neuroscience researcher who attended and spoke at a “Waking up to Sleep” symposium the same year Holmes attended his Neuroscience lab, in which he discusses how disrupting the natural sleep cycle of people, including “volunteer human’s kept in caves” could alter their perceptions of time. However, David Eagleman has written, and is considered an expert, on Temporal Illusions, and was the co-author with John Jacobson (see previous question) on the very thing that James Holmes referred to in the high school summer video of Salk Institute? Why has the MSM not questioned either John Jacobson or David Eagleman about the discrepancies their recall of John Holmes has versus every other story declaring his intelligence and superior intellect? Why hasn’t anyone in the MSM investigated “Temporal Illusions” and it’s connection’s to this tragedy, especially in light of the fact that both John Jacobson and David Eagleman are experts in that field? Why did the MSM not investigate James Holmes father’s job at FICO, and an investigation by Congress into data sellers that include FICO, since it is reported that “…The senior Holmes has a PhD in statistics from Cal-Berkeley, a Master’s in biostatistics from UCLA, and a bachelor’s in mathematics from Stanford. Over the last ten years, he has developed predictive models for financial services, and credit and fraud risk models. He is one of several scientists who patented a predictive model system used to detect telecommunications fraud…” It has also been rumoured that Robert Holmes was to testify before Congress about the Libor scandal. Why, unlike the Casey Anthony trial, has the MSM not pursued parent’s, relatives, and friends of James Holmes for interviews? Why has no one in the MSM mentioned the syllabus of James Holmes Spring 2012 semester at Colorado University, showing 24 lectures by 11 PhD and 12 MD’s, with 10 of those being about the mind or substance abuse, as this shows his level of academic research? 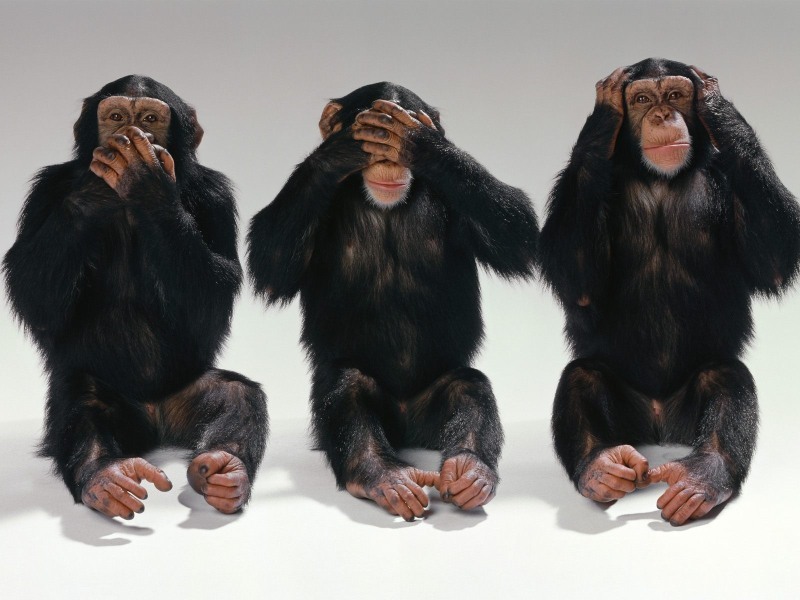 Why was John Banzhaf, a law professor at George Washington University quoted in The Australian, referring to the Colorado campus not being transparent regarding James Holmes:”…I think the school’s on lockdown because there’s so much that’s potentially embarrassing to it,” Banzhaf said. Having things disappear from websites and putting internal gag orders on shows there might be other things they don’t want coming out…” but no MSM in the United States is looking into this very possibility? Why did the court conducting the trial of James Holmes alter a document by redacting a portion showing James Holmes relationship to the psychiatrist after it had already released it to the MSM? Since we know that Dr Lynn Fenton was on the Campus threat-assessment team at James Holmes university, why has the MSM not found out if James Holmes has any type of screening by that team prior to the shootings? Why has the MSM not reported the story that a disaster exercise, utilizing a shooter in a movie theater, was taking place on the same day as the shooting, in Parker, Colorado (outside of Denver). note: This is normal for a “black ops” event, the same thing happening during 9/11 and the London tube bombings. To see what really may be happening, read my latest post, “Incovenient Truth #38: The Army DOES teach full spectrum operation on U.S. soil“, and see how a potential false flag op could be used to bring in a military-style takeover. Website of Colorado Court System with all documents relating to James Holmes case. Unfortunately my past experience has show documents can “disappear” so I will try and archive them HERE, HERE and HERE. I welcome any documents others come up with. This entry was posted in Mind Control, MK-Ultra, Problem Reaction Solution, Project Artichoke, Psychology, Psychotropic Drugs, Terrorism and tagged Aurora, colorado, james holmes, mass shooting, theater. Bookmark the permalink. the one thing i dont get about the whole thing is why did they say he got all the guns with state money when his dad is rich thats something i just dont get how can he get financial aid ? You’ve pretty much covered the inconsistencies to a T. I would rather believe this wasn’t some inside job, but the flip side is…what would you do if it was? How would you hold those corruptors accountable? There would be no way to sort it out, but they say “follow the money”. atm it’s kinda dangerous to be labeled schizophrenic. It seems that the schizophrenics share one thing in common, an inquisitive nature and a big heart who have endured a lot of suffering. I don’t know many who are outwardly violent or who want to be. Anyone who becomes deluded by an idea or ideal can essentially be schizophrenic. Maybe those who work behind the scenes are somewhat deluded as well. One question you left out. 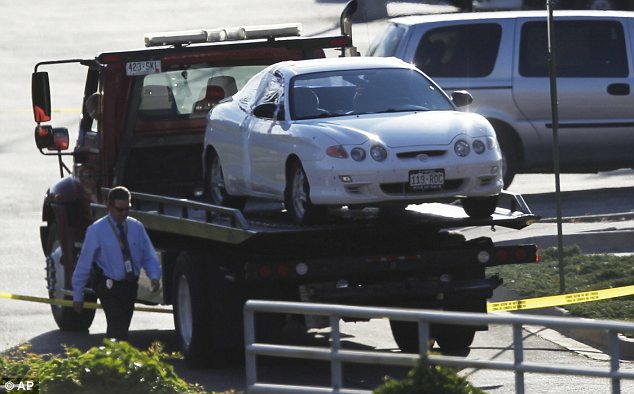 The white car in the back of the theater had Tennessee license plates, according to media accounts. If he’s from California and living in Colorado what the heck are those plates doing on that car? And who’s car is it? Why haven’t the plates been run through the system so we know who owns that car? Was it the car of the person who helped him? The person who walked out of the theater? Otherwise, your piece is brilliant. My theory about the MSM is that the big ones, ABC,CBS, NBC, FOX, the cable news outlets, etc.,are manned and run by the CIA and FBI. Remember, Anderson Cooper was in the CIA before his gigs at CNN. The plates were run through the system, and the address corresponding to that license plate was NOT the address of James Holmes’ residence. But, as you said, why hasn’t anyone in the MSM talked about this, done some research, etc. And Anderson used to be in the CIA?! Nooooo! No wonder he’s not “keepin’ them real” in this case. Your blog will be cited in the up-coming article! I’ve been banging out these youtube videos on a regular basis. The information collected here needs to be heard. The lies and the cover-up cannot remain buried. The message must become social in order to gain momentum. Please help the message become social by using the hashtag #AuroraCoverUp and retweeting https://twitter.com/AuroraLies tweets. Spread the word on facebook. Be heard. You are right. The only reason I did not include it is that it was just a hair borderline speculative (in my view). But, it is readily apparent by looking at pictures of the sidewalk that the blood splatters indicate a person was probably walking towards the exit. Thanks for this excellent point. Some more questions about the blood at the back of the theater. Note that the 15:54 CEST time in the report is 09:54 EDT 9/11/08. The first WTC tower collapse occurred at 09:59 EDT 9/11/01. The CATMAN link to something about the Tennessee plates is dead. If you mean the video, I just checked it and it is still good. 23 July 2012 – An acquaintance of the Colorado ‘Dark Knight’ gunman has been questioned by police over a phone threat to have the shooter released from jail. Yeom Pyo Lee was sought by officials after police received a message from his telephone threatening violence if James Holmes was not released from police custody. Lee, who is believed to be a student on the PhD course at the University of Colorado, Denver from which Holmes recently dropped out, was released without charge after questioning. He came to the attention of the police when ‘someone called from [his] phone and threatened violence if Holmes is not released’, according to KDVR reporter Justin Joseph. It is not known whether or not Lee was responsible for the communication. Question: If it came from Yeom Pyo Lee’s phone but wasn’t Yeom Pyo Lee, who was the “someone who called” and why did they call? If it was Yeom Pyo Lee, why did he make that threat? Question: Where had he lived before? At a location inconveniently remote from the crime scene? From the firearms and other purchases, he’d been planning this for at least two months. Hang it up dude, conspiracy theories are so 2000. You make yourself sound completely crazy. Never base your theories on incompetent shoddy news reporting of the internet age, it is complete drivel. A waste of time. Chalk it up to lousy reporting, zero fact checking and cut and paste lowest commin demomenator, never assume a conspiracy when stupidity explains it all. But the question is, how or why did he make those errors in his height and birthdate? And if he wasn’t the one who started those sites, who did? Or did someone mess with them after he’d created them? If so, why? Thanks Winston for the info. Great job! I’ve been hunting for days about this case and find it all fascinating. Another question… it was reported that James Holmes loves Batman. If this is true, wouldn’t he have watched the movie first!?! Thank you for putting all of this together (along with your helpers). I’ve dedicated nearly every spare second of my life to following the developments of this situation since 5:45am on July 20th. You’ve done the best job of putting everything together in one place. I live/work in Highlands Ranch/Greenwood Village, CO. This occurred blocks from where many of my friends and coworkers live. I listened to eye witness testimonies as early as 7am that morning and the way they described the scene and how events unfolded have not been reported with the same details by the MSM. I’ve posted your blog on my FB page and Twitter feed. We’re going to put these pieces together and figure this out. Thanks again! You are welcome. I am thinking about putting together a “hypothetical” scenario of what might have happened here; it would not be any more fiction than whats been reported so far! Yeah, do… here’s my theory, which I’ve been posting all over YouTube: Based on eye witnesses and police radio (both on YouTube), a tall, larger man in the theater (in black, wearing a mask, front row) received a call, went to the emergency exit back door and directed someone behind Theater 9. He propped the door and sat back down, which the MSM never questions. The person who was being directed parked a white car (TN plates) behind the theater exit door. 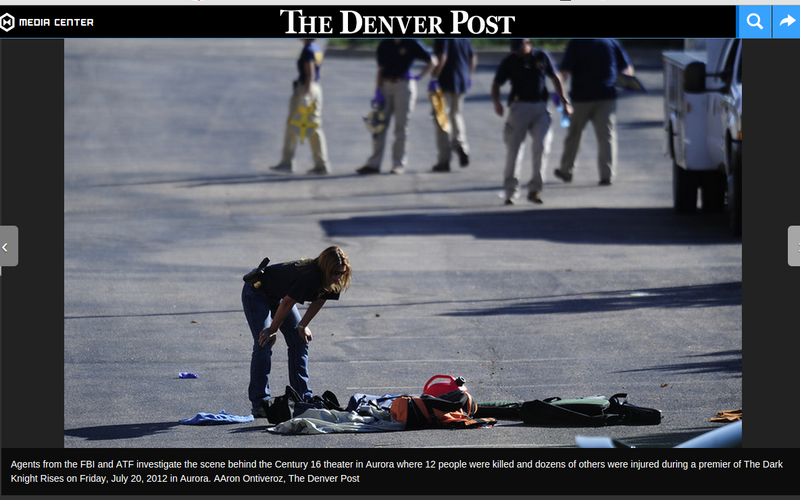 He had James Holmes with him, who was drugged and left near the car. The guy who parked the car came through the exit door and along with the guy in the front row they shot the place up and fled. They left James Holmes (or whoever that is) behind to talk the fall. The bad guys are still out there! I’m limited with characters on YouTube, so I’m not really incorporating events leading up to that night, but given all the information gathered to date, I think that could be done as well. I have something to tell you, Shempenny, I can verify something about his mentor-and the doctor working with James. I have first-person experience with associates of theirs. I need help getting this information out there. Sorry for the delayed reply. You can DM me at @shempenny on Twitter. Thanks! Thank you for your work on this rundown of incongruities. Any decent person would be bothered. I don’t know why a big site doesn’t bite this story. Very best to you. I need to talk to you right away, Shempenny. I can tell you Allison knows the same as I.
I think that “boy” that you mentioned above that looks like James.. is actually a girl. It’s probably his sister. I might be wrong but looks like a girl to me. Hmmm…didn’t consider that it was a girl…can anyone verify if his sister is his natural sister that must’ve been adopted, too? Allison Michelle Ernst is in her 30s, James sister is still a minor I think and is 15 years old. I haven’t found any verification that says James is adopted. This article says it came from one of the victim’s father who heard it from one of the cops. Now lets remember so far the cops saying James said “he was the joker” was false and the guards saying he was spitting at them has now come up as false. So let’s try not to spread things around as facts so soon. How would the cop know? would they have access to those type of records? the family isn’t talking so they didn’t hear it from them. Also consider the father is understandably upset so he could just be saying he’s adopted because he’s upset and wants more anger aimed at James. I don’t think he is adopted- his father and mother are very smart so that would explain why he is/was. Why is their a a riot shield laying down next to the corner around the theater exit? Why is there a medical backboard under his car? Why is their riot gear on the ground when he was taken in custody with the riot gear on? When it was stripped off of him he was painted red & wearing all red underneath? Why does the assault rifle have a 30 round magazine when it was reported a 90 round drum? Why blood trail leading towards the exit? Why not one single CCTV video of him entering the theater after purchasing a ticket? Or did he get his ticket on fandango? Usually on a premeire you cannot find a good parking spot and you don’t know which cinema the movie will be shown in. How did he know to park so close to the one he went to? Great additional observations and questions! With the car situation, I believe Guy 1 who was sitting in the front row, who received a call and went to the back door (per an eye witness), directed Guy 2 where to park. Guy 1 put something in the door to prop it for Guy 2. 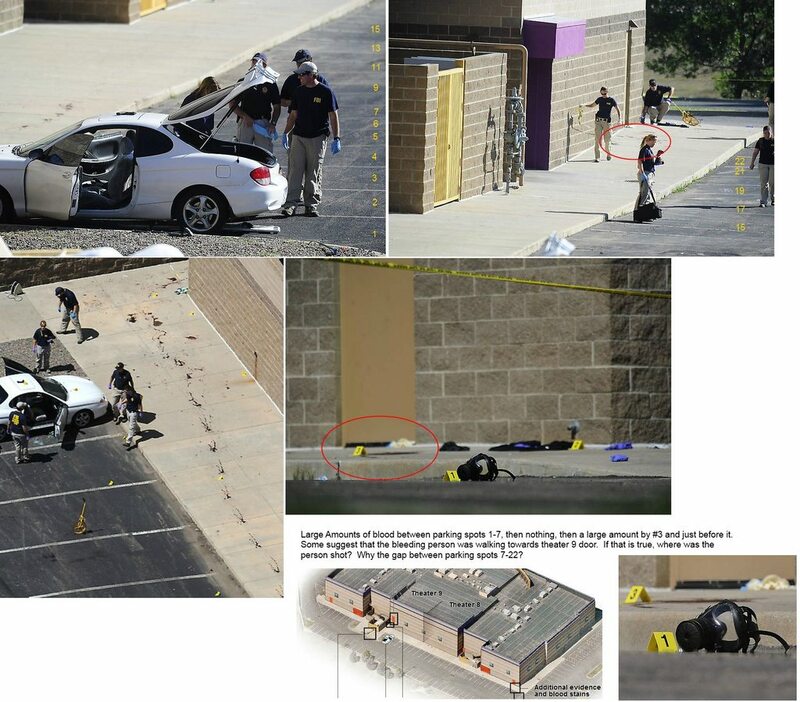 Guy 1 and 2 shot the place and fled with James Holmes left in the car drugged and framed. James has no online presence before 7-20-12. Not a single facebook page or linked in social networking looking for work or interests. Get a clue – why do people keep saying the exit door was KICKED in from the outside? He went in the right way with a ticket and he went out the exit and propped it open. Why is this so difficult for you morons to get? 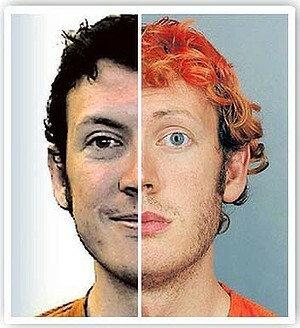 The pictures above are the same guy – James Holmes is a cold blooded methodical KILLER and insane at that. We’re not saying anyone kicked the door in (those doors open out, so the MSM is technically wrong when they say that happened). Eye witnesses saw a man who, yes, likely bought a ticket, sat in the front row, received a call, went to the back alley door, and propped it open. He or a second person came through that door (after likely parking the white car behind the theater) and did what they did. Maybe James Holmes was one of those people, but maybe not. He might have been left behind in the car the entire time. I live 15-20 minutes from Aurora and the first reports and interviews I heard that morning came from some Gateway HS students who were in the theater. One student clearly said “the shooters” several times. When the interviewer said, “Just so you know, you keep saying shooters, but it’s our understanding only one person has been detained. Are you suggesting they should be looking for a second person?” The student said, “Oh, well, I don’t want to get anyone in trouble and I know the police are doing a great job, but if you ask me, there was more than one shooter in that theater.” I can’t “unhear” that eye witness account. Other reports have stated that gas cans came from two sides of the theater. So, with all of this, we (on this site) are trying to figure out what really happened here and we’re looking at every clue that can be found. The families of the victims deserve to know the truth. You’ve done very good work. I’m glad I read this. My observations of the picture you have captioned “James Holmes and his mini-me.” Mini-me is actually the person playing the role of the “in custody” orange-haired James Holmes. 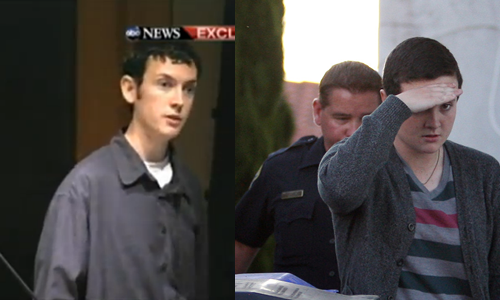 James Holmes (on the left) has dark eyes, either hazel or brown. He is lanky, willowy and perhaps tall though it’s hard to tell from a pic. Mini-me (right) has light eyes, either blue or gray-green. He is stocky and shorter. Notice how he’s deliberately shielding his face from the press. He doesn’t want to be recognized. If James Holmes was adopted and has a sister. Perhaps the sister is a biological (not adopted) child of Mr. and Mrs. Holmes. Perhaps the Holmes’s have other biological children we don’t know about..
Look at “mini-me” and imagine him with dyed orange permed hair. They’re close enough to be brothers or, even better, perhaps “mini-me” is the one playing the role of the orange-haired James Holmes. How do we know James Holmes is sitting in “isolation” in jail cell? We don’t cause these people (police and media) are proven liars. All ‘mini-me’ would have to do is get in costume (prison jumpsuit and wig) and make a few court appearances looking dazed and confused till the media disappears the whole thing down a rabbit hole,just like Tuscon shooter Jered Loughner. I know who had a motive and I believe Holmes was his Scapegoat.. All my information was sent to the Defense attorneys of Holmes.. and FBI as requested by them… political statement and assassinations made to look like ….. Pretty bold statement, let’s hear some of the evidence? So any new information yet? Thanks, and I am glad you found it informative. Updated 13 March 2013 with photo of Holmes and dilated pupils, and photo of his “parents” in courtroom. Is it possible that the differences between Holmes and his mini-me are merely styling differences meant to convey an opposite image. Holmes in button downs or t-shirts, now in a V neck, shave the hair, gain 25 pounds due to the stress of having to live through an op….. Fantastic article, thanks for summing it up! James was not adopted. The plates were Colorado, not Tennessee. I am curious to find out what blog system you happen to become utilizing? I am experiencing some minor security issues with my latest website and I would prefer to find some thing more risk-free. Do you have any solutions? b. I write a “draft”, and as I keep viewing it, I will modify the sequence of the draft to have it make sense. You don’t have to publish in wordpress until you are ready, but still can preview the draft. I am not a professional writer, this is a hobby. So, my advice is if you want to write, just write! Use the draft mode in your blog and as you refine the post then preview, then post it. 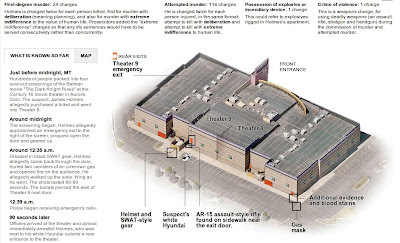 Question; How is it possible for an AR-15 bullet/bullets(shot from theater #9) able to penetrate, pass thru and exit(striking patrons in theater #8 Mckayla Hicks in the jaw) the common dense soundproof wall separating Cinema 16 theater #9 and theater#8? The AR-15 utilizes a .223 caliber bullet. Movie theater viewing auditoriums are scientifically designed and require a 65db stc class sound wall separating viewing auditoriums. This separation wall can-not be penetrated because it requires dense mass usually 12″ concrete block(Cinema 16 remodeling blueprints show 12” concrete block) with all block cells filled with sand. The AR-15.223 bullet is too light a caliber and is frangible how could it breach this wall? Why is it James Holmes Attorneys have not introduced the above mentioned scientific fact into Holmes defense? Fact…Cinema 16 theater #8 witnesses state hearing loud gunshots in Theater #8 that were louder than the gunfire emanating from the Batman Movie. Witness states hearing loud offensive banging on the soundproof separation wall that sounded like the wall was being struck with an aluminum baseball bat. Theater#8 eyewitness teacher Steve Ostergarrd gives testimony of loud gunshots, muzzle flashes and smoke grenades in Theater#8 and his student shot in the arm. Theater#9 eyewitnesses state seeing grenades being tossed from two directions into the Auditorium. Prosecution theorizes the loud gunshots were coming from Theater#9 and alleges Mr. Holmes is the shooter negating all Theater#8 eyewitness testimony. Fact…The common wall separating Theater#9 from Theater#8 is a soundproof wall. Sound waves from gunshots if heard at all by the Witnesses in Theater#8 would be muffled not louder than gunfire sounds from the Batman Movie. The loud gunshots heard by the Theater#8 Witnesses had to have come from within the confines of Theater#8. Fact…Cinema16 Multiplex Theater is DHX certified; this DHX sound certification requires the Multiplex Theater to have dense sound walls separating Viewing Auditoriums. Prosecution presents no Facts and theorizes.223 bullets breached the soundproof wall striking movie viewers in Theater#8. Conclusion… Mr. Holmes did not shoot any patrons viewing the Batman Movie in Theater#8. The attacks on Theater#9 and Theater#8 were separate, isolated, concurrent, and coordinated. Further to the above Post. This crime is the largest shooting and act of domestic terrorism since 9/11 why is it not being tried in Federal Court under the Violent Crimes Act?